An article in TODAY newspaper showed that 27.2% of fresh graduates from private education institutes (PEI) were either unemployed, or in part-time/ temporary employment even 6 months after graduation. Private education is not the first-choice education route for any average family students. They are ‘consolation prizes’ for our young people who failed to earn a place in our tertiary institutions and they are expensive for many working class parents who love their children too much to pass. 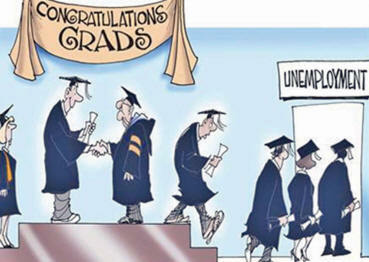 So, why are PEI graduates unable to secure decent employment opportunities in Singapore? Were the education that they received inferior education? Or is it because what they have studied has no relevancy in the job market? Or are they perceived as expensive and inconvenient second rate Singaporean graduates? Or is the civil service (being the biggest employer in Singapore) harbouring employment prejudices against them and employers in the private sector simply do likewise? Singaporeans must pay dearly in different ways when they elect an incompetent government that is unable to create any more opportunities for its people. Our citizens must by now realised that there are heavy prices that they must pay for electing a useless PAP government who cannot fly any higher or any further anymore. Today’s PAP government is no longer the very capable PAP government of yester-years. Time to wake up before all is too late. PEI Education still more expensive than sending your kids to buy a few degrees from our neighbouring countries n come back as *FTs*. This is just like spending so much money to obtain a Sg Driving Licence while foreigners can convert their *fake* driving licences here rather easily n even steal logistics/transport jobs from our sgs? If the PAP PEE M wants,he will go to lengths to get it…FT-BUS CAPTAINS after a QUICKIE CONVERSION COURSE? CLOWNS GET VOTED BY DAFTS? THIS CANNOR BE MORE FAKE? POST GFC, MAJOR WESTERN ECONOMIES RELY ON THE MANURE OF CHEAP MONEY as its economic stimulus to keep afloat. LEE-jiapore rely on the same cheap money AND AN EVER-EXPANDING FOREIGN POPULATION INFLUX to stimulate its bare-bottom GDP growth statistics. THAT HIDES A LOT OF STRUCTURAL ISSUES AND ECONOMIC MALADAPTATION TO CHANGE neglected for so long. We are now seeing the skeletons falling out of the cupboard as illuminated by the writing of this thread. THERE IS NO SUSTAINABLE SURVIVABILITY OF THIS PRETENSION. PAPpys are TRULY LOUSY ECONOMIC MANAGERS – the MSM, hid this and hypocritically pretends the opposite for too long. Unfortunately PEI students are considered of lower academic standards because they fail to gain admission to local universities. Also, if they do not complete the required 4-year program, their degrees do not qualify them for jobs in the civil service. Competition from foreign graduates and FTs only add to their woes. Yet parents have to pay so much for their PEI education. Why then are these private institutions allowed to operate in SG if their degrees are not considered to be at par with local universities? last chance this coming GE after that only Heaven knows whats going to happen to us and SG. not a pretty sight for trublus. NTU/NUS/SMU many grads also unemployed, many poly grads doing Grab Delivery. But remember last GE, they overwhelming voted PAP. An education hub is a money spinning economic machinery, it weighs heavily on quality and reputation. Government wanted to spin the economy, just like tuition centres and encouraging CPF be used for buying shares to bolster local companies and GRCs. The best way to pick up skills is on the job. No amount of classroom training and upgrading can replace that. The PAP ministers need to understand this very simple point. For every foreigner that is in a job and a Singaporean out of a job, the chances of that Singaporean getting a job again is getting slimmer. This is very simple but I don’t understand why the PAP and the civil servant elites don’t understand this point out at least acknowledge it. Another compelling reason for REGIME CHANGE. Singaporeans first. VTO. Australian govt also didn’t ensure Australian graduates got their jobs after graduated. If they do ensure, PRs and TRs in Australia can all go eat grass. There’s a sense Simon, of a satanic presence looming tall and large over the good people of original Singapore. Universal brotherhood(red) and purity of purpose(white) have been disposed of by a conglomerate of envy, rancour and avarice whose likes had never been anticipated by our beloved Dr. Toh Chin Chye and Dr. Goh Keng Swee and their chivalrous old guards. If these unemployed graduates don’t vote PAP out, they have themselves to blame. Government policies not for locals is not your government. Too many commercial schools in Singapore churning out tens of thousands new graduates each year, that is not including the 4 government universities and not including those graduating from overseas and back to look for work. Coleman & Wife the partners who CLONED Dolly the Sheep…they should stay on & clone more sheep for LKY and Breed sheep Dogs with evil eyes to keep the sheep in their PEN!!! The recognition varies. Most of my classmates went to private sector. Only one or two went to civil service/stat boards. For 70% of them, it is perfectly alright because they voted for it. cannot get employment while the number of aliens FTs PRs keep increasing because of what pap lie says about tight employment market? clap clap clap. 70% sheep asked for it. actually it is not about local Us and PEIs. after all local Us aren’t that great because pap top echelon not a single one is local U. start with clown. he is not local U. then the 2 deputy clowns, pinnochio and botak both not local Us. look at akan datang 4th generation pap. heng is not local U. neither is kee chiu bugs bunny. even that Cb joe tiu is not local U.
so whether it is local Us or PEIs the true story is cheap cheaper cheaperer alternative in aliens FTs PRs. and more than this, aliens FTs PRs no need NSR call up so solves many headaches for the business owner. who hires a local when each time he gets called up the work needs to be done by some others? so when aliens FTs PRs are aplenty, and no need wasting time NSR call ups, why hire local? I work in Uni. Scholar do not come to work, managers keep pushing things around. Siam here siam there. Cannot acquire new skill sets, keep writing EMAILS and generate lots of WORDS documents. No wonder Uni cannot innovate! Cause we have all these parasites sucking local to DEATH! !